A productive ethic guides the novelist Shannon Burke: Know the subject intimately, then write: "Fiction is about making the reader feel a time and a place and it's really hard to do this if the place isn't rooted inside you." His first two novels, Safelight and Black Flies, are set in North Manhattan, where Burke worked for five years as a paramedic in the 1990s. His third novel, Into the Savage Country, rebounds from now to then in a historical adventure featuring 1820s American trappers in Indian Country. How to mediate that gone world? Burke read everything available: "The sources that were read for this book, if listed, would stretch for several pages." And he camped! "I've spent at least two years of my life in a tent, so I'm familiar with the feeling of being out in mountains." Fully informed and infused, Burke put his excellent skills as a novelist to work, becoming the fictional trapper William Wyeth. The result is tale ringing with the narrative tone, conversational idiom, and striking vistas of the Northern Rockies and primitive settlements where the trappers worked and slept. William the novice leaves St. Louis and drags a boat upriver with a brigade of veteran trappers: "I was twenty-two years old and feverish with the exploits of Smith and Ashley." The literate Wyeth ("feverish with the exploits") seeks experience as much as fortune. His companions include the aforementioned Jedediah Smith and a rich assortment from Burke's memoir-fed imagination. They include a mad, courageous dandy, Henry Layton; the expert tanner Alene, who uses buffalo brains to process pelts; Ferris, the crack shot who splits arrows with a long rifle from 500 yards; and the pernicious Grignon, bent on mayhem. "I have no means of leaving," she said evenly. "He had only debts. The doctor has offered me an occupation. And the children need me." "His family had cut their ties with us before he died." "Because of me," she said matter-of-factly. She had a quarter native blood. "I knew his father slightly," I said. "My initial impression was of an arrogant, heartless man. Now I have another reason to dislike him. I 'm sorry to hear of all this. I offer what assistance I can." "I ask for no assistance. I will be glad for your friendship." Like the dialogue, Alene and William's deliberate courting procedure is another rich archaism the book offers our frenetic, texting psyches. Yet another is feeling the ever-present physical jeopardy of the time before health insurance. Insults lead to duels. Riding a horse killed Alene's husband Bailey. You can still make your fortune, but you'll have to square off with British trappers who'd like your scalp along with your beaver skins. Food is meat, and there are no refrigerators. Layton has a new-fangled gun, a Collier, still a flintlock but self-priming, and shoots the balls one after another. (You better shoot straight, or you'll get shot.) When you have cactus spines infecting your feet, the best doc to have is the prototypical survivalist Pegleg: "I ain't set to do anything 'cept to see how the doc's maimed him," Pegleg said. "Shame old Peggy wasn't here to help you out." 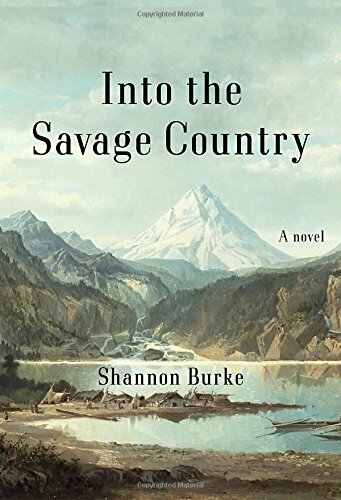 Shannon Burke's novel puts us in "the savage country" with savages as much white as native, and with "savage" implying a world of experience we sadly lack today. You're sorry when the story ends—the characters are that good, and the novel's that well made. And you'll be right to place it on a shelf next to Charles Portis' True Grit, that other brilliant conjuring of American voices and characters in Indian Territory before the western states got their names. Bruce Wiebe is a retired high school English teacher, woodworker, and Kindle reader in Lakeville, Minnesota.